Martin was born in Rochford, Essex, England in December 1958 and immigrated to Perth, Western Australia with his family in January 1968. Martin played his first ‘gig’ in a school hall (Morley High) in 1972 with fellow students. He can remember playing Apache & Peace Pipe by the Shadows, I’m a Believer – The Monkees and some Beatles songs. By age 14 he was doing professional gigs playing songs by The Beatles, Stones, CCR & hits of the time. Around age 15 or 16 Martin was playing professional gigs with some older guys (they were around 20 or so) often playing 5 gigs a week. He recorded some demos and played in various bands until 1979 when he went to London for a year. He joined original pop/rock band Urban Clearway with whom he recorded a couple of demo tapes that were shopped around the record companies. The band had some interest from Island records in London, but tired of eating baked beans, he returned to Australia & played in various Perth band line ups. The Atlantics playing on Studio 22 on ABC TV in 2000. Martin moved to Sydney late in 1989. He played & recorded with The Brookes. He thinks they were a good band, but probably not right for that time. He toured Western Australia in 1993 with the “Big Land Big Heart” tour. That band contained Dobe Newton (Bushwackers), Ernie Dingo, Dave Warner, Greg Macainish (Skyhooks) Paul Hitchins (Sports) Dave Clarke & Martin. They toured Vietnam with a similar concept in January 1994 . While in Sydney Martin performed with Slide McBride playing anything from jazz to rap and everything in between. The band literally had hundreds of songs in its reptoire. Since then the Atlantics have gone onto record many of Martin’s songs, which have appeared in feature film soundtracks, surf movies, playstation games, the list goes on. 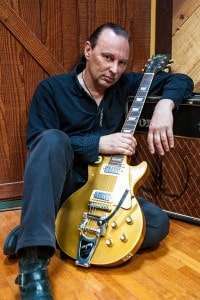 In August 2007 Martin released his solo album Revenge Of The Surf Guitar, with all tunes composed by Martin. This album has received positive reviews from here and overseas and continues to sell well to this day. Since that time he’s released four more albums The Odd One Out (2009), Surfersaurus (2011), Going to Kaleponi (2103) and Electric Christmas (2015). In 2013 Martin toured Europe with The Atlantics for their 50th Anniversary of Bombora tour. After that tour finished he went on to a West Coast tour of America with his own band. 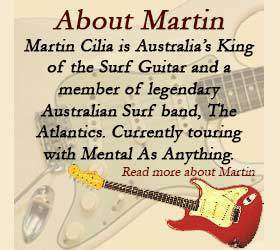 Martin is currently enjoying playing guitar and touring with the legendary Australian band Mental As Anything. Hi Martin! I’ve sort of followed you until I came over to Sydney to see my son and his family living in Miranda, and having had the honor of meeting and having a jam with you four years ago, thanks to Ian H from the Sydney Shadows club! I have since been an ardent fan and continue listening to your music and following your career! Go well and keep on rocking! Thanks Charles, hope to see you again sometime.